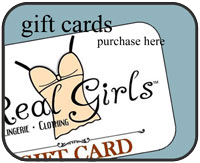 Real Girls is a specialty intimate apparel company with a unique focus on the curvy figure and buxom bustline while offering sizing for many figures. Our curvy lingerie line is inspired by the desire for intimate apparel to enhance the female form while being fun, pretty, and sensual. Our curvy lingerie collections consist of silk charmeuse items and soft mesh separates. The Peony Collection alludes to a sense of graceful glamour and includes our signature piece, a 100% luxury silk chemise with an underwire bra inset. This luxury silk chemise comes in a variety of fabrics to match any personality. The Zinnia Collection mingles fun and flirty and also includes built-in bra lingerie styles. You’ll love the playful look and amazing feel of these luxury intimates. Real Girls currently offers curvy lingerie in cup size B, C, D, DD, E, F, in addition to other luxury intimate apparel items. Pamper your curves and feel beautiful in our collections.